Producing eggs and meat on a large scale in an economically viable way, with as low an environmental impact as possible and ensuring that the need of the birds are catered for. 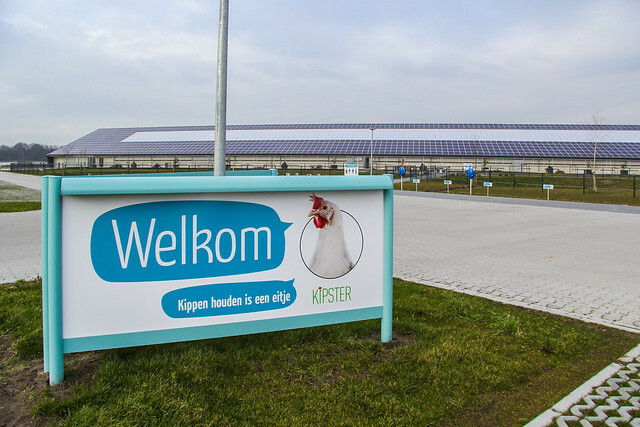 This is the thinking behind Kipster, an innovative chicken farm in Castenray, The Netherlands. Eurogroup for Animals and several member organisations recently had the opportunity to meet the chickens leading the food revolution. Ruud Zanders, entrepreneur, chicken farmer and one of the four founders of the farm led the visit. The farm has 24,000 hens (Dekalb White variety) divided into four sub-groups of 6,000 birds each. They are housed in a central barn with a number of simple, but according to Ruud, essential innovations. Central barn, showing natural light, high ceilings and space to move. The first is natural daylight – lots of it thanks to the extensive window area on the sloping ceiling. Ruud is a firm believer in the importance of giving the hens plenty of natural light, and says it minimises the incidence of feather pecking meaning that he does not need to trim the hens’ beaks (standard practice in conventional systems). The hens’ living quarters allow them to fully express their natural behaviour: space to move and flap their wings, soil to scratch in, perches and branches to perch on and the chance to take a quiet nap (or should we say ‘kip’). Again simple elements, but ones that are missing from the lives of the 220 million hens that are still reared in cages in Europe. The hens have access to outside areas: during daytime they can go out onto ranges with soil and perches. Hens busily scratching the soil. Both inside and outside spaces include trees to make them more appealing to the hens: descending from forest birds, chickens prefer the comfort of covered areas, especially where they can perch. Unfortunately for the birds and visitors, since December 2017 all farms in The Netherlands have had to keep their flocks inside because of avian influenza risk. Male chicks, which in conventional farms are usually killed at birth and turned into pet food, are a valuable resource at Kipster where they are fattened and sold in products such as ‘Rooster burgers’. In the near future, the first generation of hens that have reached the end of their egg-laying days (so-called ‘spent hens’) will also be turned into meat products. Solar panels on the barn roof. The sustainability of the operation is addressed in a number of ways. Extraction fans that remove up to 95 percent of fine particles from the air to ensure that there is no question of Kipster harming the health of people living nearby. Ruud hopes to be able to prove that the air coming out of the farm is cleaner than the air coming in, as the farm is a few hundred metres from a motorway. That is not the only source of local pollution: when they got out of their cars in Kipster’s car park, the visitors were hit by the smell the pigs being kept in enclosed barns on the neighbouring farm hundred of metres away, but not a whiff from the hens in the building in front of them. The farm produces twice as much electricity as it needs from the 1,078 solar panels on the roof: the rest is sold back to the Dutch grid. Perhaps most interesting is what the hens are fed on: meal produced from waste products from food industries, such as bread and biscuits. Ruud explained that in this way people and chickens are no longer competing for food. On most intensive farming farms animals are reared on food that people could eat (corn, maize, soy etc. ), which is highly inefficient. Kipster has in effect gone back to what happened on any farm before industrialisation arrived in the 60s: chickens turning scraps and waste into something that people find lekker! Results after the first six months of operation are promising. One of the reasons for the project getting off to such a good start is the exclusive contract it has signed from the outset with LIDL. All the eggs and rooster meat are sold by the chain with three Beter Leven stars in its shops in The Netherlands. From an animal welfare perspective, Kipster is a very interesting model. Faced with the persistent threat of avian influenza, it is resilient and gives hens good welfare even if they are deprived of outdoor access.